When It’s Really Cold Out …. … and you’re really thirsty, but just don’t want to stop playing to go inside for a drink. This entry was posted in Humor, Pets, Photography and tagged Cody, icicle, Puppy Cody, thirsty, winter. Bookmark the permalink. 33 Responses to When It’s Really Cold Out …. Thanks, Victo. Just goes to show – post ideas can come from anywhere! Hey VD, I’m posting that recipe you wanted, in just a few hours. Smart dog. That’s a very nice photo, too. Thanks, Dan. It wasn’t easy to get that photo – glad you like it! So cute. My babies like to eat snow…or lick the puddles on the deck, which I wish they would not because of the chemicals. When Cody was a puppy, she used to eat dirt and pebbles. Freaked me out. 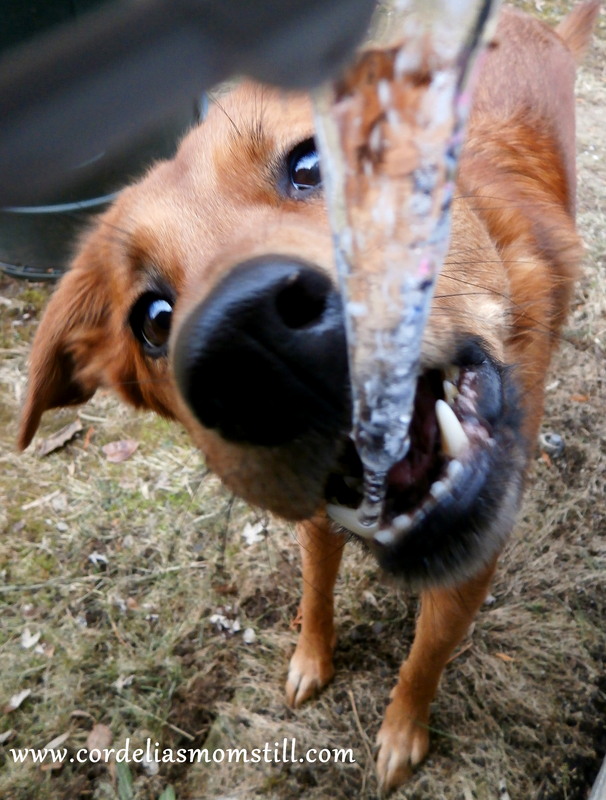 Most of my dogs have loved ice cubes, but Cody’s the first one that went after icicles. And she just learned today that the ice over the frozen puddles in the backyard cracks when she steps on it – and there are yummy old leaves and other cool stuff under there. Yuck. Yes, it is. You just have to be I the right frame of mind to see it sometimes. Thanks. Cody deserves all the credit. Got to admire that dog!! Thanks, Willow, she is a great dog! BTW, I apologize for the delay in replying – your comment wound up in the spam folder. Hi Puppy Cody, you’ve got the right idea, that’s for sure. Life is for playing, no matter what the weather. Love Puppy Stan. Of course, puppies are for playing! Duh. Woof. Amy! I only just saw your comment – you know I would have responded sooner. I’m honored that you like the photo. It was more luck than anything. Well, that and having to squeeze my fat old self behind that faucet to get the picture! What a great picture! That takes some serious camera skills. My dog is really picky about how she drinks water. We can’t even get her one of those water cooler type bowls because the gurgling scares her. Thanks! That icicle was coming out of the faucet behind the house, and I had to try to squeeze between the faucet and the house itself to get the shot, and then I had to get Cody to cooperate. My hands tend to shake when I take a photo, so I’m amazed I was able to get this one without it blurring. She is a very pretty dog, especially when she smiles. Thank you! Puppy Cody can make any day a better day. I love this picture. Reminds me of two border collies we housesat who used to have a great time whenever we had to get the hosepipe out! The funny thing is, Cody doesn’t really care that much about water. We bought her a wading pool once, and she would go anywhere near it. But there was just something about that icicle! Thanks for the visit – hope you come back often.